Review written by and copyright: Rick Curzon (20th February 2018). 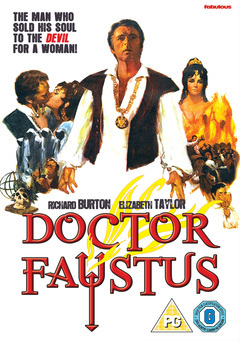 Faustus (Richard Burton) is a scholar at the University of Wittenberg when he earns his doctorate degree. His insatiable appetite for knowledge and power leads him to employ necromancy to conjure Mephistopheles (Elizabeth Taylor) out of hell. He bargains away his soul to Lucifer in exchange for living 24 years during which Mephistopheles will be his slave. Faustus signs the pact in his own blood and Mephistopheles reveals the works of the devil to Faustus. A film record of the 1966 revival of Christopher Marlowe’s 1588 play The Tragical History of Doctor Faustus. The big problem is that it’s a photographed stage play and despite the best efforts of cinematographer Gábor Pogány - his lensing is rich and textured - it never transcends it’s stagy origins. All the acting is that old school declaiming to the gods type of stage acting. Whilst not exactly bad, it is shown up cruelly in the intimacy of the film camera. However, it’s all very flatly directed and dull. It was nice to see Doctor Who’s Harry Sullivan (Ian Marter) as the camp king. We have a pretty standard and more that acceptable standard definition transfer of an attractive, detailed, well photographed source. As far as standard definition goes I didn’t see any distracting print damage; it’s an incredibly clean source. No posterisation, no mosquito noise, no macro blocking or any other kind of compression artefacts that I could detect. The crying shame is that Fabulous Films haven’t gone the extra mile and put this out as a Blu-ray. It’s also baffling that it’s an NTSC disc in the normally PAL market. A standard 2.0 mono track which delivers the dialogue heavy soundtrack clearly and well. It’s lossy and as such lacks depth and range. However, the jury is out as to whether the vast majority of people will be able to tell the difference on a mono track from 1967. Mario Nascimbene’s marvellous score is judiciously used to counterpoint dramatic moments but as this is a photographed stage play and as such never upstages the text. None. A crying shame because this was an interesting, if imperfect production with plenty of interest behind the scenes. Apart from using Burton and Taylor the cast is made up of The Oxford University Dramatics Society and there must have been plenty of great stories to tell. A missed opportunity to release a Blu-ray edition of this very attractive looking, richly coloured film which has great sets and cinematography; all of which would look peachy keen in HD. As is, we get a pretty solid standard definition NTSC DVD ... which is bizarre considering this is a DVD for the UK PAL market. Mind you, modern TVs ought to he able to handle NTSC. One that’s most likely going to appeal to film or theatre buffs; this is a visual record of the 1966 Oxford Dramatics Society's Burton & Taylor production.